Ivana Komadina is a music editor and producer of a one hour long program called "Put svile - The Silk Road" devoted to world music. The program is scheduled once a week, Sundays at 1 p.m. CET on the culture channel of the national radio of Serbia - Radio Belgrade 2. Ivana is a musicologist, journalist and a music critic. 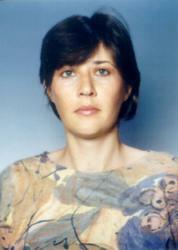 She has been working for Radio-Television Belgrade since 1985. She is the author of a large number of TV and radio programs devoted to various musical genres, from classical to world, and she pays particular attention to different styles of music outside the realm of the commercial. Currently, besides "The Silk Road", she presents two weekly shows: "The Autograph" devoted to early music and "Time of Music" devoted to recent music events. Ivana is a member of The Belgrade Summer Festival council. "The Silk Road" started in September 2002. The main concept of the show is an attempt to make a "radio-journey"; besides world music, it thus includes various information about particular countries, their culture, history and customs, as well as fragments of some interesting travelogues. Very soon after starting "The Silk Road" became one of the most popular programs of its genre in Serbia. It received excellent reviews in newspaper and has a very high rating.